One of our chefs, William and I were very lucky recently to be able to visit Alexandria in the north of Italy and spend some time with local and now Michelin starred Chef Andrea Ribaldone and his team. The city itself is full of history and like anywhere in Italy, it has a fierce food culture. The region is known for its white truffles and rice along with many other things. Our first night at Due Bulli we were able to get a table in the restaurant and had the tasting menu. Course after course of inventive, modern Italian cuisine followed, all grounded in the style and tradition of the region. Fantastic food, service and wine, Will slept well that night that’s for sure! The next day was spent in the kitchen with Chef Andrea, his team of talented chefs and our gracious host and translator Marco Truffelli. Getting to see the team in action and learn how a top Italian kitchen makes certain dishes was an eye opener. One thing I was keen to see and understand was how they make, handle and cook pasta, of course! We took a break from the kitchen to go and see a local pasta producer. The shop was tucked down an ally in the middle of block of flats, no sign, just a door. There is no way that anyone who hasn’t grown up in Alexandria would ever find this place, let alone know that it exists!! The owner is the third generation pasta producer so what he doesn’t know about pasta isn’t worth knowing. One of the machines they use to make agnoloatti was over 50 years, it’s run every day for hours on end and has never broken, yet all the modern machine break down all the time! It was amazing to see how the pasta was made to such a high standard and an honour to be allowed to see into this world. 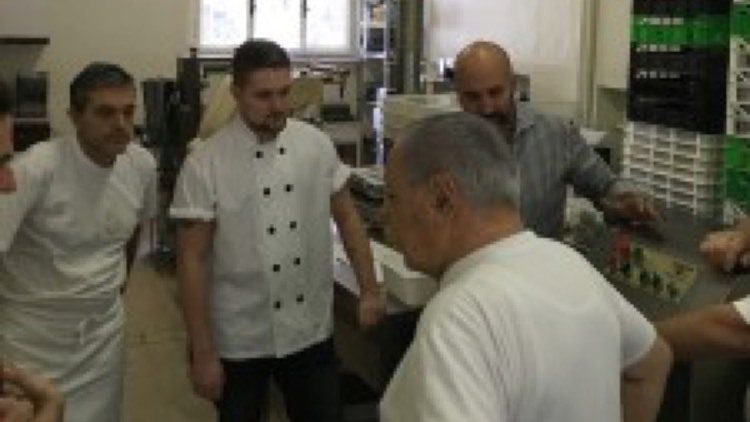 They were all such a friendly bunch of old school pasta producers and true artisans. That night we went to another local restaurant and had yet another fantastic meal, Alba truffles had just arrived and featured in pretty much every dish( I didn’t mind too much ) a Fantastic pie of cardoon, artichoke and black truffle then the signature risotto with a mound of alba truffle shaved on top. So simple in terms of number of ingredients used, but so many complex flavours. This was a great chance to explore a city and a culture and to learn from the masters themselves. An invaluable experience for young chefs like Will to be involved in but also for myself. I can’t wait to get back into the kitchen and bring some of what we saw into our restaurants.